Okay, now I’m not one to read the box for contents or anything so at first sight I see the case and holster, simple enough. 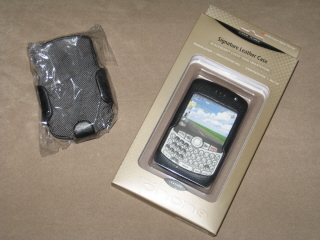 After I open it however, I am also greeted with two additional items; a clear plastic film screen protector and a grey cleaning cloth. I was quite impressed with the cloth itself; I’ve never seen one included with a case before. My cloth for my glasses won’t have to pull double duty with my BlackBerry anymore! More Bang for Your Buck - the cleaning cloth is a Nice Touch! The Curve slid in rather nicely into the case (very much a leather Skin), as if to snuggle in for a good night’s sleep. The case accommodated for every port and button on the Curve leaving an opening, even for the LED! 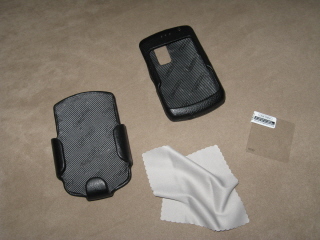 The case can be used alone or with the holster, allowing the phone to sit facing out or in. The holster also has a clip that can rotate 360 degrees, allowing for a comfortable carrying solution. One should note that the case/holster combo does not provide sleep mode. Assuming the typical quick draw position you would find in most Western movies, I wanted to see how easily I could remove the phone and case from the holster. With a finger on the bottom of the case and a thumb on the holster clip I could easily respond to a pin or answer a call with impressive speed. The film is square where as the Curve’s screen is rectangular. I tried to apply the protective film to the screen I found that it wasn’t large enough, it left about a ½ cm space unprotected. This was disappointing as I felt it would better fit a Pearl’s screen. 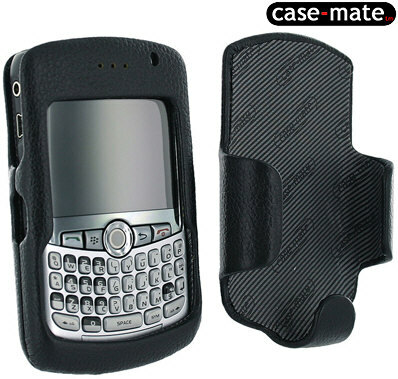 Both the case and holster’s interiors are cloth lined which is adorned with Case-Mates logo. The cloth lining is to allow for easy removal and appears to be glued, which may come loose over time on the holster, though it’s held up fine for me so far. 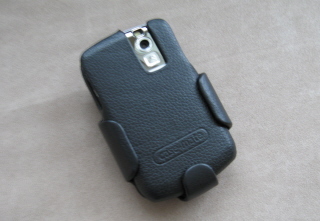 The holster’s clip feels more durable than on BlackBerry’s lambskin leather holster. With respect to the case itself I found the Curve somewhat difficult to remove, having to pry the case slightly open and drag the device out. As I pulled the Curve out I noticed that, due to its form fitting nature, the case would rub slightly against the Curve’s shell, keypad and screen before letting go. Over time I am worried that it could cause some cosmetic damage on the Curve. If you pull the battery cover off your Curve on a regular basis, this is something you will want to pay attention to. 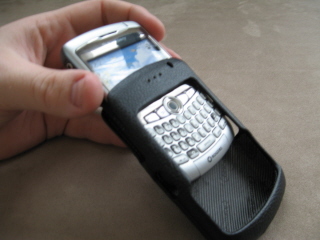 On the other hand, if you have rarely seen under the hood of your BlackBerry you’ll appreciate the snug fit. The Curve Coming out of its Shell - Snug Fit! 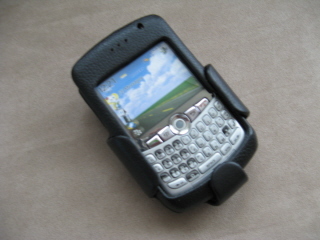 Navigating was easy enough with the case on, though it did feel bulkier, as though I was using an older model of BlackBerry. The bottom lip of the case comes up a bit too high and too close to the buttons for my taste, which causes the bottom row of buttons to be difficult to use. 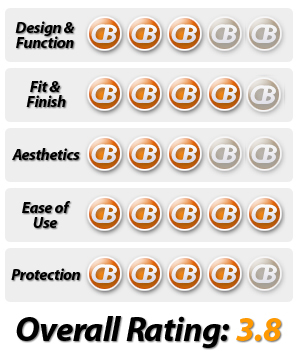 The bottom row buttons are accessible, but require more of a 'vertical' stroke (tip of your thumb/finger). If you type more on the 'flat' of your thumb/finger the case may get in the way. I thought maybe those with smaller fingers would have an easier time than me. But I passed the phone to my wife and she also had a difficult time accessing the bottom row with her fingers, disproving my hypothesis that smaller hands were needed. Now comes the fun, time to see what kind of abuse it could take. First I tried dropping it on the floor. It survived as expected with no visible damage to either the case or the Curve. Due to the case’s design, the raised edges to the case protected both the screen and the keypad from any damage if dropped on a flat surface. Next I insert a dummy 8300 into the case and toss both the case and holster down a flight of stairs. On the first bounce the case and dummy 8300 separated from the holster though again no apparent damage was seen. I took the carnage outside and tossed the case and holster across the lawn. The case held on in the holster longer this time, only dislodging itself as it spun in mid air after the third bounce. Again, no damage to be seen. For those who may be a tad less careful with their devices, this would be an appropriate accessory. Both the case and holster provide great protection from everyday wear and tear, unless you fall down a flight of stairs. As previously stated the price of the case itself is $34.95 and the suggested MSRP for the combo is $49.95. The screen protection would have added extra security if it had actually fit the screen (if you read this Case-Mate, make it fit!). I found that the device focused on fashion and fortitude over function. It looks nice, can take a decent beating, and for the most part has good design - it does accommodate the ports, buttons, speaker/mic and camera, but I found the access to the bottom of the keypad and lack of a sleep mode disappointing as these are critical for everyday usability of the BlackBerry.